During the specification stage of the model development, the structure of the model was defined more precisely. Building on the scoping stage, the exact functions used within the model were selected that will allow the model to be used for the broadest possible range of uses, based on the client objectives, likely uses and analysis of the data. Key decisions regarding model segmentation, choice model hierarchy and the format of inputs and outputs are agreed at this stage. 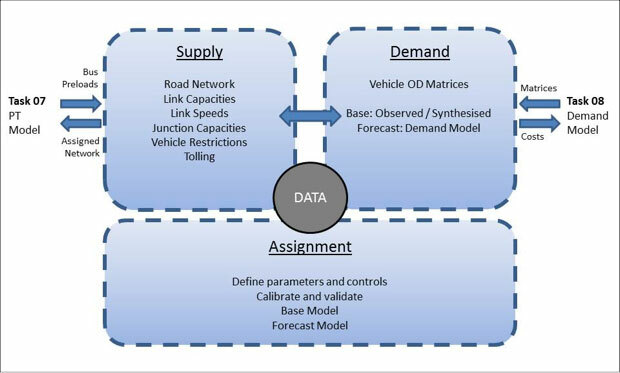 The Demand Model is integral to the ERM and the other four regional models. 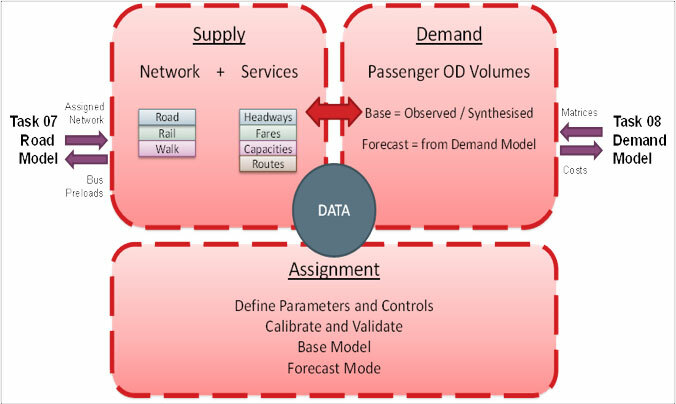 The demand model processes all-day travel demand from the NDFM and outputs origin-destination travel matrices by mode and time period. The Road and PT Models then assign these travel matrices to determine the route-choice of trips in their respective transport networks. The core feature of the RMS is the Full Demand Model. This processes the all-day travel demand from NTEM and outputs origin-destination travel matrices by mode and time period. These are combined with the matrices from RMSIT and passed to the Assignment Model which then undertakes road, PT and Active Modes assignments to determine the route-choice of trips in their respective regional transport networks. The Road Model assigns trips by private vehicles to the road network. It includes capacity restraint, and the impact of congestion. Travel times are calculated in response to changes in assigned flows. .The Road model uses local authority info on traffic signals and volumes, HERE GIS Database, Census POWSCAR Data and the National Household Travel Survey. The PT model assigns trips by PT to the appropriate PT network. It also includes the capacity of restraint, i.e. crowding on PT vehicles, impacting on peoples perceived costs of travel. The purpose of the PT model is to allocated PT demand in a given time period to PT services and routes operating between origin and destination zones. Input data sources: NTA Journey Planner, Bus Public Timetables, Census POWSCAR Data, National Household Travel Survey, Airport Travel Survey, AVCL and RTPI Data, Rail/Luas Census Passenger Counts, Bus Cordon Counts, Ticket Sales Data. The purpose of the Active Modes Model (AMM) is to allocate pedestrians and cyclists to routes between their origin and destination zones. The model will be representative of the walk and cycle network throughout the relevant modelled area, with particular focus on the representation within urban areas where walk and cycle trips are most prevalent. 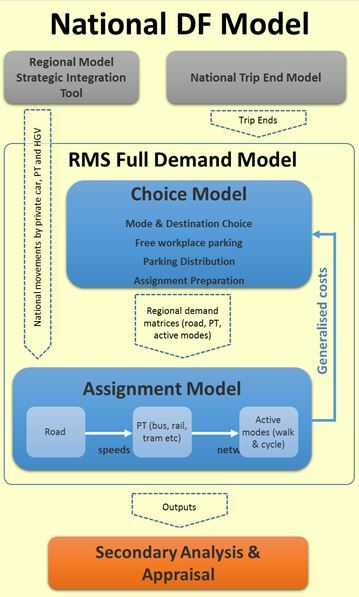 Costs of travel are calculated within the AMM for input to the demand model. The zone delineation process aims to create a zone system which allows us to accurately model travel demand in the model area concerned. The process involves taking Census Small Areas (CSAs –the smallest spatial level that data are available) and manipulating zone boundaries to create zones that take account of physical boundaries (motorways, rivers etc. ), and represent homogenous land use types and activity. The process has been split into two main steps i.e. Preparation Work and Zone Delineation. Within these steps, the process is broken down into chronologically organized tasks which are described in greater detail throughout this report. The process is iterative in order to achieve an acceptable balance between the various zone delineation conditions.